Not that it really should have mattered in the end, but I've had one of those weeks that really screw with a person's head. This was the week the new windows arrived at my apartment, and the combination of moving furniture out of the way, letting the construction guys in for a day and then cleaning up after the considerable mess they left behind and only then moving my furniture back to where it should have been really threw a monkeywrench into my schedule. You try working from home with all that going on! Furthermore, the TV show I'd taped and had been looking forward to turned out to be unimpressively dull. And finally, as the crowning glory of a rather annoying week, I discovered that my only copy of Raiders of the Lost Ark had been scratched, and I can no longer get my Indy fix. To most of you, I expect that last one would be a minor irritation, easily shrugged off. To an archaeologist like me, it's a tragedy. Trust me. There were nearly tears. So, it was with a rather large amount of trepidation that I approached my cask this weekend. After the drubbing my psyche took this week, I was definitely not looking forward to another dose of the awful Glen Parker. But I screwed up my courage, poured a sample, and had a wee sip. Hence the silver lining in this post's title. There have been some nice changes in the whisky. I'm now very happy to report that the Glen Parker has been upgraded from Terrible to merely Bad. 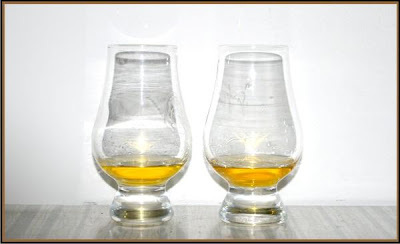 The whisky from the cask is on the right. The uncasked version is on the left. Even though I wasn't too confident about the colour change last week, I think it's clear that casked version is a darker amber. That's good. It definitely means there's a bit of oomph left in the cask, and that I'm not merely hallucinatorilly deluding myself into thinking the whisky's getting better. Which it most definitely is. Like I said, it's bad. But that's actually a really good thing considering how terrible it was when we started. On the nose, there's a nice smokey aroma rather like a fine cigar. Richer than just wood smoke. It's still sort of washed out though, as if it hasn't reached its full strength. I take that as a good thing; I'll give it as much time as it wants. That faint fruity note is there still, and I'm still struggling to identify it. It's not quite strawberry, not quite grape...it almost reminds me of bubblegum, but that's not it either. Maybe rosewater? Loukoum? Neither of those are fruits, but they're in the right ball park. Ah, well. There's a sweetness of some kind hiding in there, waiting to come out. I'll let you know when it does. The taste has also improved, but some of the unpleasantness is still there. It continues to have a coniferous taste, though it's moved away from pine to ceder with a hint of spruce. The oak is blending in well, and there's a billow of smoke appearing on the finish, which is nice. The fishy pungency is there still, but it's fading slowly, overtaken by a grainy flavour. I still find myself hoping for the richness of vanilla but finding none. Overall, the biggest change is that I no longer pucker my lips and wince when I have a sip. It's still several steps from being really drinkable, but it seems to be moving in that direction. As long as it gets there eventually, I'll be happy.